I cut my teeth in online debates in a group called does God exist(DGE) on facebook about 3 years ago. I had been an atheist for a long time but was not active in it in any way. I married a Muslim woman and she tried to introduce me to Islam. Her family showed me the nice early Meccan verses and I thought, “well this is not so bad at all!”. I then read Quran for myself, then I read it again because I was not so sure how anyone could buy into it. 3rd time of reading I figured it was time to take to the internet and see what other people think. I went to Islamic apologist sites, then went to anti-Islam sites to try to find a balance between each ones propaganda. I looked at the premises and explanations(tafsir) put forward by the apologists and applied logic and reason, it just didn’t add up. I looked at the logic applied by the anti-Islam proponents and they made quite clear the hate speech and sexism and violent passages of Quran and hadith. I took to the Facebook groups and watched debates from afar for a while before daring to ask a question or make a statement. During this time I was also attending Madrassa with my 4 Muslim step children. What the Madrassas were teaching and what Muslims were saying in public were not the same. We changed Madrassa 4 times as we didn’t think it was right to teach the children non-Muslims were dirty and Jews were not to be trusted, nor Christians. This was the message conveyed in my experience in these small groups. No tolerance for Kufr. Anyway, back to the debate groups. As I said, I watched from afar and saw some really pointless exchanges in many groups. Groups that were badly moderated, people just name calling towards each other and Muhammed. I am no fan of Mo but trying to rile someone by offending them is not winning a debate or discussion. Maybe that works for some people but it wasn’t for me. I stumbled in to does God exist by chance(yes theists, things do happen by chance). 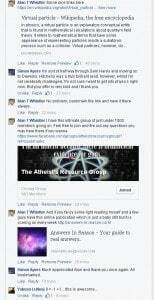 I found a group of very intelligent atheists that actually engaged and supported claims with links to prove points. Theists were usually overwhelmed and couldn’t debate for long. I would follow the links and try to absorb the content. I would click other links on the pages and learn more on perhaps biology or physics, sometimes philosophy or maybe refresh my theology or bible quotations. This started a huge learning curve, one which is still curving today and my thirst for knowledge just grows and is fed by the articles posted on my new found atheist friends walls and groups they have started or post in regularly. 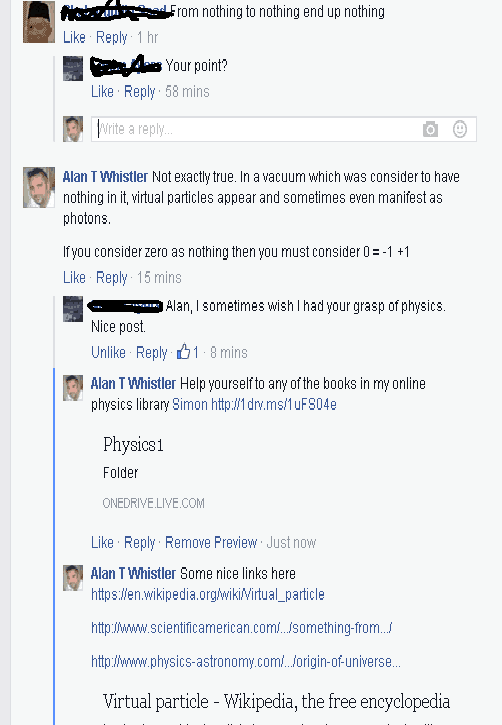 The information sharing and genuine thanks given to each other in comments for sharing knowledge is heart warming. We have groups like Space Invaders, The Science Lounge, Cosmos: A Space Time Odyssey and Knowledge Is Beautiful contributed to regularly by many of the atheists I see debating theists in the groups I frequent. Debating groups such as DGE and Debate Faith, Atheist & Christian Debate. Oh and not forgetting my little intimate Atheist Resource Group. Now don’t get me wrong, there are aggressive debaters in all those groups who seem to just want to offend but there are a regular crew of long time members that actually take the time to try to correct theists when they misrepresent something in science. These theists have gone to a religious site and have been fed pseudoscience or been presented with “logical arguments” for their gods and have fallen hook line and sinker for the half truths or just outright lies fed to them by someone trying by any means necessary to further a justification for their worldview which is based in ancient superstition or myth. Others have been fed information since childhood by their parents and it is only natural to accept at a young age what your parent tell you is truth as just that, usually without question. when they see the pseudoscience or arguments presented on the faith sites it acts as a confirmation bias supporting their preferred belief. 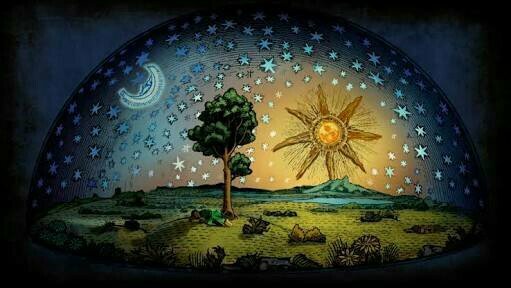 It can be difficult to get through to people and convince them that the science we are presenting is real, yet they only seem to challenge the science which goes against their worldview. coincidence? Back to the internet atheists. I can only thank the unsung heroes of logic and reason for the knowledge they have passed on or for pointing me in the right direction in where to look for more information. 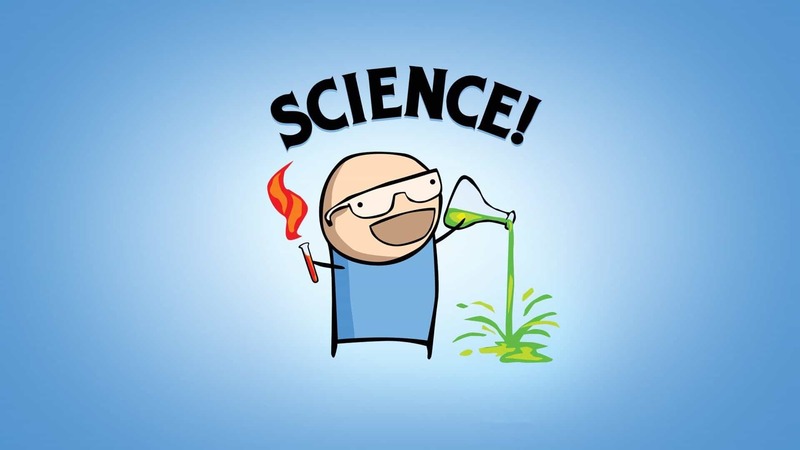 Keyboard warriors or hobbyist scientists, it matters not. I have been called both over the years. Theists actually believed it was a derogatory term but my hobbyist real science knowledge trumps your incorrect strawman science any day. I now possess the ability to correct misrepresentations of science and can attribute this to my peers in the debate groups. For this I thank you. All the writers and editorial staff here on www.answers-in-reason.com have met in these very groups. Again I am honoured to be in their virtual presence as I have learned so much from them over the years and am flattered to be considered to present articles which will be published next to their writings, and the biggest thanks is for correcting me when I get stuff wrong. A hard pill to swallow but always appreciated!! Last Wednesday evening(March 9th, 2016) I had the great pleasure of meeting my fellow admin from DGE and founder of www.answers-in-reason.com, Christopher Pyke in the flesh. We met up to attend an Aron Ra talk just outside London. 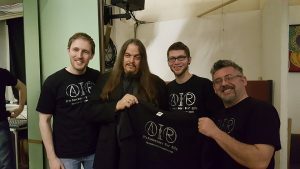 We were invited by the hosts Wycombe Skeptics in the Pub, and with Aron’s permission, up on stage to give a quick promo of ourselves. They also graciously projected our site to the big screen for all to see. This was most unexpected but very very much appreciated. Not really what the theists portray an atheist as, that being selfish and immoral. Nihilistic in worldview. Lacking respect and abusive. This article is homage to you good folks that have not tried to suppress knowledge and have helped form the debater/writer/skeptic/humanist/atheist and generally well rounded man I am today. You truly are inspirational!! To you all I raise a glass and send my warmest thanks!! Then something like this comes along and makes it all worthwhile. Ever heard of confirmation bais? This article is rampant with it. You say Internet theists have fallen hook line and sinker, while internet atheists are the unsung heroes of logic. This would almost be utterly hilarious were it not so tragic. By all means show how theists are the bastions of logic and reason when it comes to debating religion in online debate groups. We would love to see that article. No need to, that’s not my contention. Sure, theists can be illogical, but so what, lots of people are illogical including atheists. I understand your appreciation, but you are demonstrating an unbelievable amount of confirmation bias, and if you were truly as dedicated to truth as you seem to suggest, then the galling amount of bias should be truly alarming to you. But it’s not, you’re oblivious to it, and instead try to turn the tables on me try to make it my problem. Well whatever, I’m happy to agree to disagree. I just wish there was a little more intellectual rigour displayed, even as you accuse others of a lack of it. If you had to be specific in pointing out the actual confirmation bias what would you point to exactly? – we are not above reproach and are happy to correct any issues in our articles. I think Alan has done well at describing his journey and discoveries within debating groups. 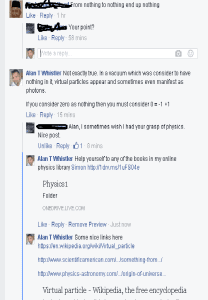 The praise he offers to the internet atheists are those that pointed him in the direction of scientific evidence. I myself have learned a lot from debating – from both sides of the fence, but only one is filled with evidence. If examining evidence provided and making a decision based on valid evidence is confirmation bias, then that is something I suffer with too. Well, there have been some decent theistic debaters in online forums. Anymore though, it just takes too long to do very much online debating, so I don’t blame them for not spending too much time doing that anymore. So many times the same questions get asked over and over again, and often, those on the other side either don’t care to really debate (as I have found especially with Muslims on social media forums), are trolls (both atheists and theists), etc. All in all though, I have seen more than enough lack of logic on multiple sides of the debate in 7+ years of online debate. Neither side really has a monopoly on logic, as it were. Even so, I don’t care to make this into a debate right here. Just chiming in. Debating…. well, anymore, takes way too much time. Time is often better spent in reading and analyzing the literature. If you had to be specific in pointing out the actual confirmation bias what would you point to exactly? This is akin to saying, “you are wrong everywhere”, but not actually showing where. I will happily correct the article if the need is there. I’m not saying you should say false things about theists and atheists to give a more balanced perspective, but I am saying it’s revealing how low you perceive the theists in your online debates. 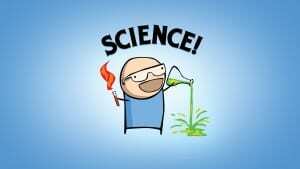 It could be that you have met the worst of the worst theists who are science deniers or whatnot. I personally know a few who are like this, but most are not. My experience is quite different to yours, and sometimes it’s atheists who are equally obtuse, going to extraordinary lengths to hold a view on a topic that is so obviously false, or who justify taking an approach that if a theist took would be laughed out of the room. I say this not to say atheists are silly or anything like that, but merely to point out that my experience is not reflective of your description. One possible reason is you’ve been incredibly unlucky and only seen the silliest that Christianity has to offer. Or the other obvious possible reason for this is your own confirmation bias at play. You even acknowledge that visiting sites that support your preferred belief will act as confirmation bias, and then elsewhere explain how you went to a whole bunch of atheist sites that support your preferred belief!!! So surely the obvious conclusion is that you are potentially a victim of confirmation bias too? If so then that would explain the extreme polar descriptions you give of theists and atheists here. Do you know what I mean? I’m saying it’s the pot calling the kettle black. I’m saying what’s good for the goose is good for the gander. If theists, when visiting their sites increase confirmation bias, then isn’t it also possible that atheists, when visiting their sites increase their confirmation bias also? If the answer is yes, then I rest my case and thank you for admitting it! If the answer is no, then this really is a galling example of confirmation bias right here, and you’re blissfully unaware of it. Of course it’s true that we are all victims of confirmation bias to some degree, it’s in our nature to be like that. But the important thing is to at least acknowledge our own confirmation bias, and be aware of it. You seem to be unwilling to do that, which in my mind makes you less reliable as a source of information or good ideas. But I’d like to be proven wrong about that. Over to you. Do you frequent Internet debate groups? As the piece says this is 3 years worth of observation of such groups and yes perhaps a generalisation but based on strong undeniable trends. I didn’t just spend a day monitoring and jump to a hasty conclusion, this is weighted on actual experience. So much of a trend that I started a resource group and in there there is a files section which I have created files that I can just copy and paste responses from because the theist debating so predictable. Ontological or first cause/Kalam argument. The trend is that strong. Yes, I do frequent Internet groups. I do see theists say silly things as you mention, and I also see atheists say silly things too. Atheists are not the bastion of reason like many atheists want to believe. Theists are not either though. We are all just people who have firm beliefs and think we’re correct for various reasons and some of those reasons are silly reasons, no matter what we believe. It’s just part of human nature, atheist and theist alike. You are right to a point. We allude to this briefly in our about page and also have posts like Which Atheist Arguments Should We Stop Using? The thing to take from the post though is that Alan was speaking about a particular experience rather than generalising across all atheists. I have met some incredibly bright Theists and incredibly stupid Atheists. I’ve met many people who engage in fallacies and ridiculous arguments, and I have been guilty of doing it myself. If I was to put it on a sliding scale though, it would be heavily weighted towards the theists and their ridiculous arguments. That is a bet you would lose. Ironic how you are wrong even before any debate even begins. Do you have a topic in mind Eric? I caught your discussion with Hunter Glen on evolution. You want to try that discussion again with me perhaps? I am open to other suggestions if that doesn’t suit you.